One of the newest addition to our popular range of glueboard fly traps. 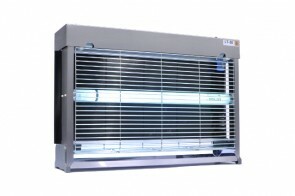 The LT features completely redesigned units made of stainless steel H17 - DINX6Cr17-1.4016 - AISI430 as smaller medium-range electric insect killers, which ensure unparalleled simplicity in terms servicing. Replacing the glueboards is extremely easy – during servicing you simply slide it from the side of the lamp. Moreover, to ensure simple access for replacing the UV-A lamps, the protective nets have simple clips to unplugging and blocking system. As a result, the regular servicing is faster and simpler than ever before. 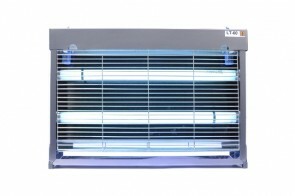 The LT double-sided light insect exterminators are equipped with two or four shatterproof UV-A lamps, which translates into up to 160 m2 of coverage area at maximum 60W of power consumption. Due to its low weight and small dimensions, these electric fly killers can be easily hanged or left free-standing.